Posted by bowenrs on Tuesday, April 10, 2018 in Commentary, Events. First-year Human Organization and Development student Marguerite Manning never considered going into environmental policy until now. 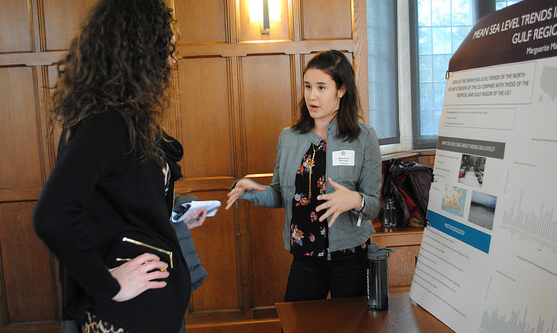 Marguerite recently presented her poster Mean Sea Level Trends in Regions of the U.S. at the Vanderbilt Celebration of Learning where she developed this project for an Earth and Environmental Science lab course she was taking. In her project, she examined how sea level rise was affecting various regions of the United States in different ways. However, she not only wanted to explore the differences in sea level rise, she also wanted to investigate the factors that influenced this phenomenon. What she found was that sea level rise was higher in the North Atlantic region as compared to more tropical regions, such as the Gulf. However, there were many factors at play ranging from topography to a multitude of human factors. Marguerite also learned that sea level rise is not uniform. She stated that some regions of the United States are actually experiencing sea level decrease which runs counter to the rhetoric surrounding constant sea level rise in the world. She was excited to see all of the factors the influence sea level rise and decrease and was surprised to see that it’s not just humans contributing to this phenomenon, but there are a variety of natural influences as well. Project: Mean Sea Level Trends in Regions of the U.S.